The study also examined what consumers say they know about different insurance products, along with their perceived need of these products and whether they own them. Overall, consumers are most likely to say they are knowledgeable about life insurance (46 percent). Knowledge levels drop significantly for disability insurance (38 percent), long-term care insurance (35 percent), and annuities (35 percent). 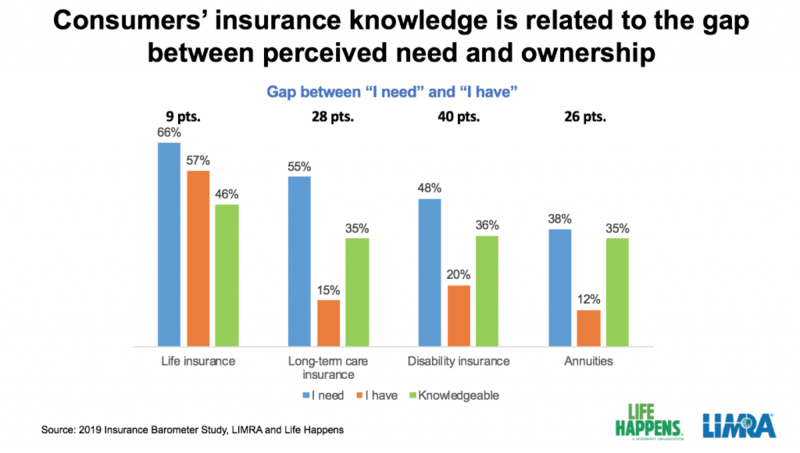 The study shows there is a correlation between lower product knowledge, and the gap between perceived need and ownership for the product (see chart). According to the survey results, there are more than 42 million consumers in the market for financial guidance. About two-thirds of those using social-media sites for finance-related topics are looking for information on product and services (62 percent), or looking for reviews on financial professionals (61 percent). Consumers, predominantly Gen X and Millennials, are using social media when assessing financial professionals; 34 percent say they would research financial professionals on social platforms.